The sources report gives you a deeper look into how people are originally finding your site. The metrics in the report let you compare how visitors are interacting with your site across these different sources. The report can be used to help you develop and define marketing campaigns by creating strategies based on historical performance. Sessions: a series of analytics activities taken by a visitor to your website. Activities can include page views, CTA clicks, events, etc. A session expires after 30 minutes of inactivity. Contact conversion rate: the number of contacts divided by the number of sessions for the selected time period. New contacts: the number of new contacts created during the selected time period. Customer conversion rate: the number of customers divided by the number of sessions for the selected time period. Customers: the number of customers who originally converted on your website during this time frame and are currently in the lifecycle stage of Customer. New visitor sessions: the number of new unique visitors on your website. New session %: the percentage of sessions that are from new users. Page views/sessions: the average number of page views per session in the given time range. Avg. session length: the average duration of a visitor's website session. For any of the following sources, you can compare up to 7 of the metrics above. To adjust the metrics in your report, click Edit Columns in the upper right of the table. Select the checkbox next to the metrics to display, then click Save. You'll see a chart visualization that illustrates any selected metrics across all sources. Toggle between each metric by clicking the dropdown menu at the top of the chart. Please note: HubSpot automatically excludes traffic from sites that are added to your site domains in reports settings. When you click the name of any source, you'll be able to drill down into more detailed information about the specific channel or campaign associated with that source. Organic search displays sessions from non-paid search results in known search engines such as Google, Bing and Yahoo. Click Organic search to view the search terms that visitors used to find your tracked site. The first breakdown for organic search is the searched keyword. You'll likely see the first row containing Unknown keywords (SSL). This is due to the way that some search engines encrypt data when users are logged in. Google encrypts all user search data, making it impossible to know which keyword led to the session. Click a particular keyword to see the referring search engine, such as Google, Bing, Yahoo, etc. Referrals display data from external sites linking to your website, thus producing a referral session. If you add domains to your site domains in reports settings, it will not count as referral traffic. If you click the referrals link, you'll see the first drill down of all the sites that are linking to your website. The first breakdown for referral traffic is the referring domain. Click any referring domain to see the specific pages from that domain that link to your site. One referring domain may have many pages that link to your site. If the link to your page has been removed by the original referrer, this will still remain in sources because it has generated traffic from that referral source. Social media counts links that come from a social website. Social media allows users to share content with other people. These social channels do not actually write content themselves; therefore social media isn't counted under inbound links or referral traffic. Under social media, you'll find the common channels such as Twitter, Facebook, LinkedIn, and Google+. You'll also see a handful of other sites that are considered social in nature, such as SlideShare, Reddit, Tumblr, and Wikipedia. Wikipedia is included under social due to the open-source nature of their website. The breakdown of traffic for social media is the social channel that brought in your visitors. 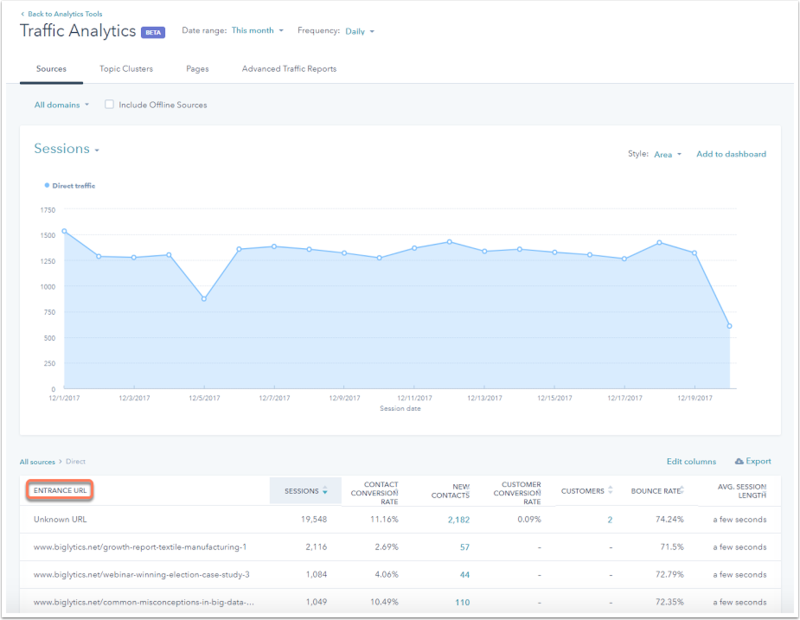 The second breakdown is the campaign associated with that session (set within the social media publishing tool in HubSpot or using the utm_campaign parameter for tracking URLs). The first breakdown of email marketing traffic is the email's campaign name. This campaign is set within the email tool for HubSpot emails or using the utm_campaign parameter for tracking URLs. If there is no campaign associated with the email, you'll see hs_email for standard emails sent from HubSpot. Additionally, if you see hs_automation, this is the default campaign assigned to automated emails sent through workflows when no campaign is defined. Please note: if someone clicks a link in an email sent through another email service provider outside of HubSpot, and it does not contain specific tracking parameters, this session will count as direct traffic. There is no other indication for the analytics to detect the original source of the session. Learn more about how to set up and implement tracking URLs. When you open a particular campaign, the second breakdown presents the name of the email, which is set by using the 'utm_content=' tracking parameter (this is done automatically for emails sent from HubSpot). Emails that have been deleted display their original internal ID, not the name. You may occasionally see new contacts generated from your emails as a result of emails being forwarded to friends, family and/or colleagues of your contacts, and those contacts convert on your website. Direct traffic shows sessions that accessed your site by typing it directly into their browser or a link that does not meet other source bucketing criteria. Within the sources report, you can drill down further to see the Entrance URL of a direct traffic session, which is the URL a visitor entered into their web browser to reach your site by direct traffic. The other campaigns source displays any sessions to URLs created with the tracking URL builder in HubSpot. You can drill down into other campaigns to see the specific campaign name. The second breakdown for a specific campaign is the source/medium as dictated by the tracking URL you created. The second breakdown for Other Campaigns is source/medium as dictated in your tracking URL. If none are found, it appears as none/none. If you select the Include offline sources checkbox, you'll see offline sources included in your sources data. They won't appear in your sessions graph, as there is no website traffic associated with offline contacts, but they will appear if you click the dropdown menu in the upper left of the chart and select New contacts or Customers. API: contacts created via the Contacts API. Imported: contacts that were originally created as new contacts via list import. Form: contacts created when a contact submitted a form through a filtered IP. When a contact submits a form through a filtered IP, your sources report updates and disregards the sessions. The contact has no sessions and is therefore bucketed under offline sources. The analytics tool doesn't receive data from the original source, but it knows the conversion ID and recognizes it's from a form, so it gets categorized as an offline source. Paid search displays sessions from paid campaigns, like from Google AdWords. Learn more about which sessions get categorized as paid search. The breakdown for paid search is the campaign name, set using the 'utm_campaign=' tracking parameter. If no campaign is present, this is listed as No Campaign. The second breakdown is the keyword term searched for by the person who clicked your ad. If the keyword parameter is not found in the visited URL, the term is set to Content Network (Adsense or Other). If the keyword parameter is present in the visited URL, but it was encrypted by the ad service, the term is set to Unknown Keywords SSL. On your main sources view, you'll find the number of contacts and customers generated from a particular source. Click the number to view a list of contacts. In the right panel, click the name of a contact to open their contact record. You can click Export to export a list of contacts, or click Use in list to add them to a list in HubSpot. You can also use contact properties such as Original Source to create active lists of contacts.